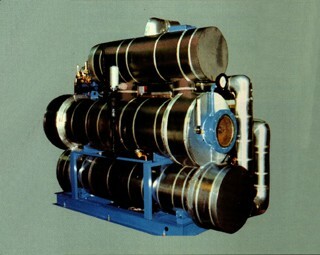 40 horsepower, water cooled chiller system used to condition air. 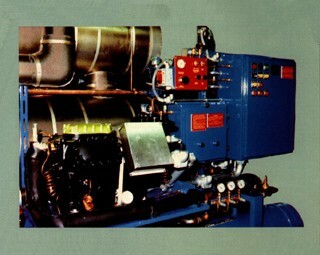 A system was need for a manufacturing process to handle 3,800 SCFM of 40 degrees F air at -40 degrees F dew point, 5 PSI. This unit is capable of cooling air from 163 degrees F, 100% RH to 40 degrees F, 100% RH. In this cooling process, water is condensed and the removed at the air exiting end of the chiller. The air the enters a desiccant dryer (not shown) where the dew point is reduced to -40 degrees F. A flooded evaporator is used to keep the air pressure drop to a minimum. The vessels and piping are insulated with foam glass, the covered with stainless steel as required by the customer. Space limitations resulted in this design being as compact as possible. If you have a need for specialized electrics we can provide them to your specifications or to NEC and NFPA.